Today’s lovely wallpaper (click on image to download) shows the Westerbork Synthesis Radio Telescope (WSRT), at the Netherlands Institute for Radio Astronomy (ASTRON), not the Onsala Space Observatory, as the linked page would have you believe. 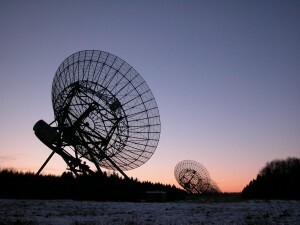 The Westerbork telescope works on the same interferometry principles that determine the design and use of other mobile arrays, such as the Very Large Array (VLA) at the National Radio Astronomy Observatory, the One-Mile Telescope at the Mullard Radio Astronomy Observatory (MRAO), and the Australia Telescope Compact Array at the Paul Wild Observatory. Although you can’t really tell from this photo, one thing that sets this array apart from most is that the telescopes have equatorial, rather than alt-azimuth, mounts.